The boys and I were talking about the election today. I asked if they wanted to participate, which they did, so I made 'ballots' for them. The ballots were pretty simple: pictures of each candidate, with their names, and a box to check. I only printed the top races: President/Vice President, US Senate, US House, Governor, State House, and State Senate. The election was purely done based on pictures of the candidates. Sam, age 4, seemed to randomly select candidates, telling me he picked each one because he "liked" them, but was unable to tell me why he liked them. Wil, age 5, chose his candidates based on particular features. Since I thought his reasons were interesting, I will share them here. For President, Wil chose Romney/Ryan because Biden looks too old with his white hair. He also thought Obama had an old face. For US Senate, he picked Donnelly because Mourdock's eyebrows are scary. Good reasoning for a 5 year old. 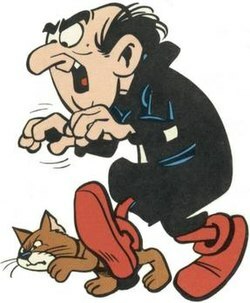 He's seen The Smurfs cartoons from the 80s and those eyebrows remind me of Gargamel's. For US House, Wil picked Shelly Yoder. She reminds him of his teacher. For Governor, he didn't like any of the candidates because they all looked too old. Interestingly, he didn't pick Matt Pierce, who is running unopposed for State House, because he has glasses. Even though Chris and I both wear glasses, he says he doesn't like glasses -- except on us. For State Senate, he picked Stoops. He didn't have a better reason than that he liked him. So there it is: not knowing anything else about the candidates, they had to go based on looks. And 'looking old' is a huge liability for young kids. So is looking scary. It's amazing how many adults still choose candidates based on their child-like instincts. :) Good lesson.